Joel and Jerome are brothers who came to Rafiki right when the orphanage had just started taking children in February 2010. While both parents are alive, they doubted their abilities in taking care of the two boys. Joel is 10 years old and in primary five. Jerome is 8 years old and in primary two. When the ministry first took in these sweet brothers, we were informed that their father had died and their mother had abandoned them. Through tracing and multiple assessment the ministry learned that both parents were still alive and living together. The parents had left the brothers with their grand parents in the village. Immediately family assessments were started and the brothers started visiting their parents during holidays. The visits helped the brothers bond with their family, get used to their parents, and the brothers started talking about their family with the other children in the home. We decided to reunite the brothers with their parents who were all happy and welcoming! 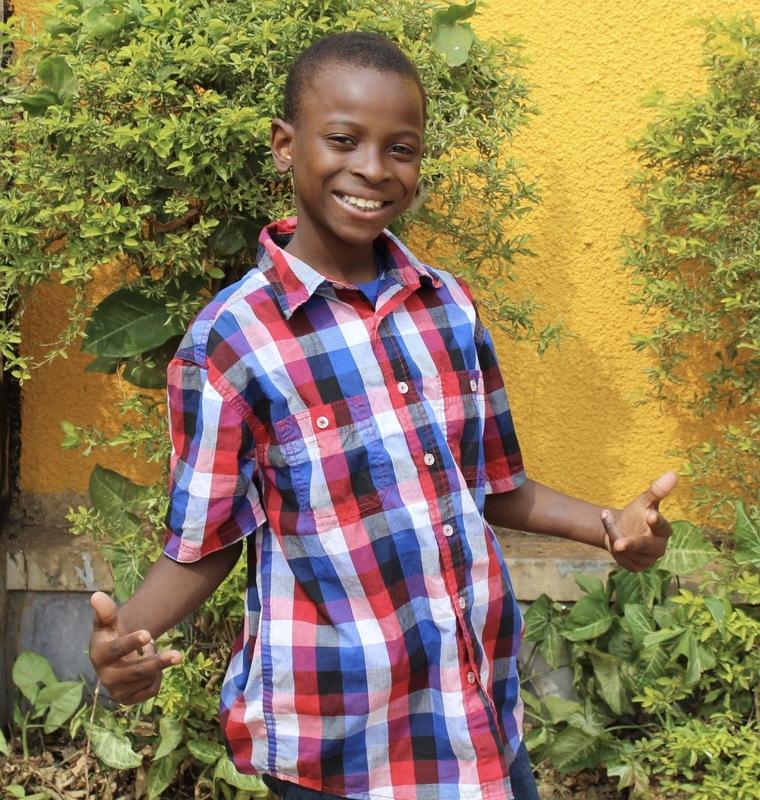 On February 18th, 2015 Joel and Jerome were resettled with their parents in Munyonyo. The ministry was able to help find a school for the boys. We empowered the family to begin a project that could generate extra income. Our social worker, Florence continued to visit the family and make sure that the brothers were doing well at home and doing well in school. Towards the end of 2015 the brothers were brought back to Rafiki for a short holiday with other children. The parents had a misunderstanding and the father abandoned the mother right before the boys were about to go back home. The mother tried to look for the father, but without success. The mother decided to continue with the plan of taking the boys home to the village. After two weeks at home with their mom she got ahold of our social worker Florence. Florence was notified that the brothers were having health problems and the mother could not get them proper treatment. Rafiki stepped in and brought the boys to a hospital to get treatment. The boys have recovered, but continue to stay at Rafiki so they can attend school. If you are interested in sponsoring these brothers please contact us at sara@rafikiministries.org. This week has shown us what a blessing families can be! We were able to resettle four siblings with their grandfather. 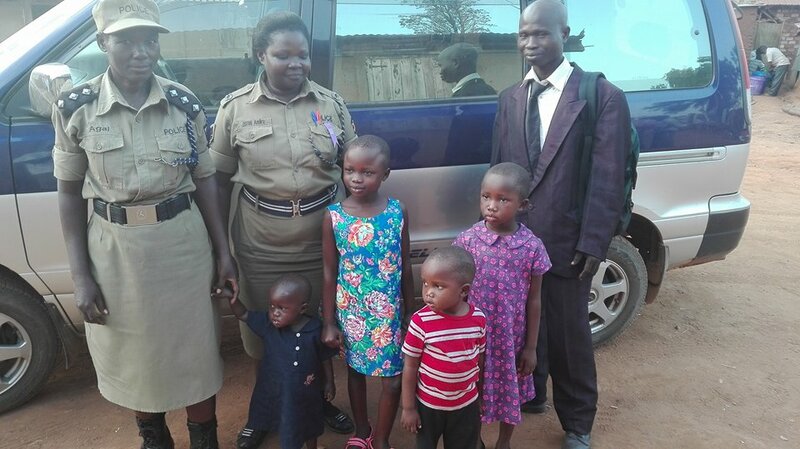 We met Winny (7), Sofi (6), Mungu (3), and Tina (1) on Thursday, June 23rd after they had been found and brought to the police station. They were living with their father after their mother had left to marry another man. They were living in this unfinished house as care takers. After their father and older brother ran away, Winnie went looking for help. She made it to a police station where she told a Child and Family Protection Unit officer about her situation and her siblings. The CFPU was able to have Winny take them back to where her siblings were. The CFPU officer knew a pastor friend who would take them while she began looking for their parents. Within hours of being at Rafiki we realized just how bad the living conditions had been for the children. The next morning, Friday, the aunties spent an hour getting jiggers out of the feet of each child. After a few days, Rafiki was called on June 23rd to see if the children could stay with us while they continued to look for family. The team was able to go back to the place the children were found and talk with a neighbor who told us that the mother had left four months earlier. While staying at the Rafiki childrens home, Auntie Doreen was able to spend some time talking with Winny to learn about her family. Winny was able to give us the birthdates of not just herself, but of her siblings, tell us where her father and older brother worked, as well as where some other family members lived and/or worked. Our social worker, Florence, worked with the police to trace down all of the people we had information for. At one point the father had been taken into custody, found too unstable to take the children back, but we did get to meet the older sister of Winny, Sofi, Mungu, and Tina. The sister talked with Florence about their life before coming to Kampala. They lived in a village about 11 hours from Kampla in a good house with both parents working. Though Winny, Sofi, and Mungu did not attend school, they were all well taken care of with plenty of family around. The parents had some terrible circumstances came up, which cause Winny’s parents to leave their stable life behind and move the children to Kampla. 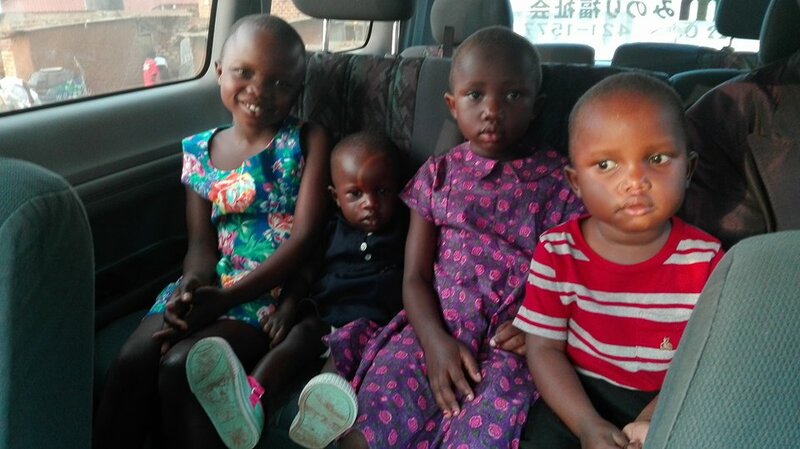 Winny, Sofi, Mungu, and Tina had family, a home, and older siblings all waiting for them back in their village, so Florence worked with their sister and grandfather to see about resettling them. An uncle came forward who offered to make the trip with them and return the children to their family. On Tuesday, July 19th, the uncle came to the Rafiki house and helped get the children ready for the journey home. The children were so happy to be going home and after getting some new clothes packed they were off to the police station to say good bye! After saying goodbye to the police team they were off on an 11-hour bus ride to the village they called home. Today, July 21st, the uncle contacted Florence and gave us a little update. The sister even got on the phone to talk about how happy her family was to have the children back and how happy the children are as well! The children were with Rafiki for not even a month but we will surely miss them! We would like to be able to ensure that Winny, Sofi, and Mungu can begin schooling. If you are interested in sponsoring these children, along with their sister Tina, please contact us at sara@rafikiministries.org. We are looking for people to come serve for one month to a year at Rafiki Children's Home in Uganda this year! 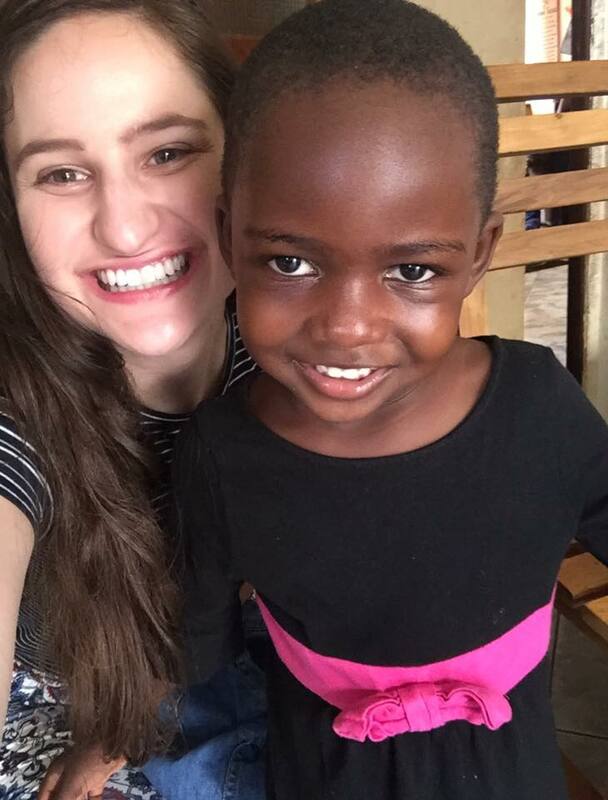 Read about Abby's time at Rafiki and consider coming to serve, to be changed, and to make memories of your own. My time thus far at Rafiki has been such a joy. I arrived at the beginning of May, and cannot believe how fast time has gone by. Through my journey so far I have gotten so many unique opportunities to grow spiritually, mentally, and physically. The staff here is amazing, and they’re all such hard workers. I have been especially touched by Mama Monica. They say she speaks the least amount of English, but I still find our communication to be quite effective. She has such a servant’s heart, and is so good with the little ones. I love watching how gentle, and kind she is to each and every kid. She’s always working in the kitchen, or helping with baby Florence. Her heart and love for every person in this ministry has truly inspired me. I have gotten the opportunity to meet kids that have previously lived at Rafiki, but now have been resettled in their homes. I loved visiting Emma (Emmanual) whose family lives in a village and has a little farm with chickens, pigs, and sheep. 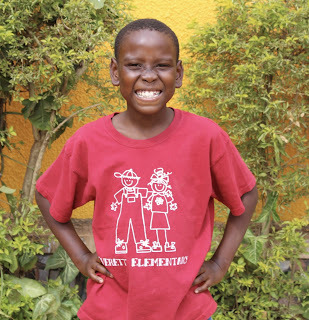 Rafiki helped the family start this farm, so they could help provide financially. It was really neat to see the happy reunited family, and to see how greatly this ministry had impacted their life. I have also gotten the opportunity to shop in the local markets, which is always an adventure. I have also gotten the opportunity to serve at Sanyu Baby Home, which has been really eye-opening and neat. I have loved doing outreach here and look forward to going to volunteer at more organizations! The kids here are so sweet, and well-behaved. It’s been amazing to see growth in the kiddo’s in such a short time span. One of the younger boys James has grown from the baby room to the big boy room, and has really played the part. It’s really neat to see how he has matured, and now helps with other little ones. I have been touched by each of the kids in different ways. Just to name a few Hannah has really improved her listening skills, as well as Ruth. The older kids are very well-behaved , and are always willing to help with the little ones or lend a helping hand in the kitchen or in washing their laundry. Since I have been here, we have gotten the addition of two other children Baby Florence and Max. What a blessing each kid has been to me, and to each other. Max is now fully immersed in this life, and used to the routine. At first, we thought he was a baby, so it’s incredible to see how much he’s grown physically and just in helping take care of himself. Mom Sara and Uncle Joseph have been incredibly welcoming to me, and have invited me into their home on multiple occasions. I have loved getting to play a small part in this ministry, and just see how God weaves everything together here at the orphanage. The African lifestyle is one to be admired. I have learned to bathe kids in minimal time using minimal cold water. I have learned to not be phased by finding ants, bugs, or baby spiders in food we’re preparing. I have learned to cut onions without crying. I have learned to prepare the breakfast of buttered bread sandwiches for every kid in a speedy amount of time. I have learned a few Luganda key phrases I will use every once In a while. I have learned to perfect the African fried omelet. Throughout my time here, I have learned quite a few things, but most of all I have learned to not only embrace, but love the African lifestyle. God is doing amazing things in this country. In church last week, they showed how much the community has grown physically in 30 years, & how you couldn’t find a café 30 years ago. I love seeing people so passionate about advocating for Uganda. Uganda is a stunningly humid and green country, that I have fallen in love with. God is doing incredible things in this and through this organization and I’m so grateful to be part of it if only for a short time. After a long time, our dreams are coming true! Rafiki has been blessed to have purchased 5 acres of beautiful land for Rafiki's Children's Village in Kakiri, Dambwe, Wakiso, District, Uganda. With the new land comes the hopes and dreams for the new future of Rafiki Africa Ministries. Currently we have people working on building the entrance/gate and getting the perimeter fence set up. We are all really excited for the great things God has in store for Rafiki as new changes come! We serve a great and mighty God! Working on building the entrance! Creating the new home for Rafiki Africa Ministries will require many projects! This new land will allow us to grow and impact more children's lives through building a school and medical clinic, homes for the children and staff as well as allowing us to do sustainable farming, raise animals and drill wells - playing an important role in the community! The perimeter fence in process! Along with all that... there are many different fruit trees established on the property which will help greatly in food provision! We are also excited about these old pigpens on the land that we have plans for turning into chicken coops, which will go a long way into helping Rafiki to be self-sustainable. I cannot express how grateful I am to have the opportunity to serve here in Uganda among my brothers and sister in Christ. I am excited to be a part of the very beginning of the new place! After being here for only a short time I have fallen in love with Uganda and have plans to return and serve with Rafiki again in the near future! I am so excited that God allowed me to join on mission with Him. Uganda has become part of my life and I have dreams of spending much time serving down here. My hope is to be able to join ministry in reaching out to the desperate in the slums of Africa where there is no hope, and spreading the love and gospel of Jesus, expanding the kingdom of Christ. Once I return to America I will be working to get more people on board to support God's mission in Uganda and hopefully recruiting people to return with me to help with the construction of the new Rafiki Home. This past week, on Monday I went along with two other volunteers and Rafiki AfricaMinistries to a nearby community to evangelize the gospel and to encourage the people that lived there. Upon our arrival we were met with a recent news update from one of the members of the community. He reported that there had been four deaths the day prior due to fighting that has been occurring between a neighboring district. These people who live in this community had come from the North where many of them were forced to fight in the war and were forced to kill family members. There people are bitter against life and are having a hard time making a living or even knowing how to enjoy life. Our first stop was to go visit a family of a child whom Rafiki has been caring for many year unable to locate and contact her family. They were excited to finally find the family and the family was excited to hear that their child was doing well and has been well taken care of. After our visit we walked door to door visiting with the people, comforting them, encouraging them and sharing the gospel with them. We had eight people in our group so we split up into four groups of two as we went out into the community. Most of these people did not have bibles but many had a religious background and were familiar with the bible. We had been able to take with us ten bibles and ten households rejoiced and thanked us for giving them a bible. The people in this community were very receptive and welcomed us into their small home offering us the best seats in the house. They listened while we talked and were receptive of the Gospel. Before we would leave a home we would ask them if we could pray for them and what could we pray about. Many people had requests for healing from disease, protection over their families, job needs and the provision for school fees. These people live in very small one room apartments which are very primitive. Many of the women make jewelry from paper beads and sell them to make ends meet. Most of the people that we witnessed to were not Christians and one man that we spoke with admitted that he wasn’t a Christian but that he wasn’t ready to accept Christ as his Savior. One of the men that we spoke with understood the gospel and professed to be born again. This man made a comment that left an impact on me. He said “You know the gospel message is so simple, I’m a sinner and Christ is the only way to heaven and though him only am I cleansed of my sins.” His belief and faith encouraged me. The gospel is simple and sometimes we can make it seem more complicated than it really is. Romans 10:9-10 says 9 because, if you confess with your mouth that Jesus is Lord and believe in your heart that God raised him from the dead, you will be saved. 10 For with the heart one believes and is justified, and with the mouth one confesses and is saved.”The gospel is simple enough that a child can understand it if we don’t make it complicated. One of the other groups had the joy of leading a person to Christ! We had a joyful time sowing the seeds of the gospel and encouraging these people. We plan on making more trips over to this community and will continue to encourage these people and continue to share the gospel with them. Many people here welcome hearing the gospel and love being visited. People all over the world are hungry for something more than what this world has to offer them. My question to myself and to others who may be reading this, are we being faithful to reach out to all people? What are we doing to share Christ with those we come into contact with? I have struggled in the past with sharing the gospel because I was always nervous about having the right words to say. Well, I still sometimes feel nervous about speaking to others but the desire that I have for them to hear about the good news and having the assurance that Christ will work in their hearts gives me boldness. Also, knowing that sharing with others isn’t about what I can get out of it but that the purpose is to further the kingdom of God and to bring Him glory. Rafiki Africa Ministries'children, Staff,Volunteers and Directors express their support for Nigeria´s kidnapped girl students and their families. We stand with Nigerians to #BringBackOurGirls. “The recent abduction of girls by militants in Nigeria is abhorrent, and Rafiki Africa Ministries strongly condemns the act as a violation of human rights.